Today, Joe Morris and William Roche, two of our Recruitment Consultants here at Strictly Recruitment, alongside some of the team from Pillsbury Winthrop Shaw Pittman, had the pleasure of taking part in ‘The Breakfast Challenge’ at the Whitechapel Mission, which is currently one of the most popular forms of volunteering to help the homeless. This was an extremely rewarding experience, where they assisted in the preparation and cooking of breakfast for as many as 300 people. At 5.45am, all the team had a short briefing of what they should expect, and began their day at 6am. The first task was to prepare breakfast, which involved; preparation and cooking of bacon, sausages, beans, tomatoes, eggs, mushrooms and hash browns, buttering of bread and making of toast. Everyone also had the responsibility of making and serving over 400 cups of tea and 600 cups of coffee. This was continued throughout the day, along with collecting plates, wiping tables, washing up, as well as giving out towels, soap, razors, shampoo and toothbrushes. 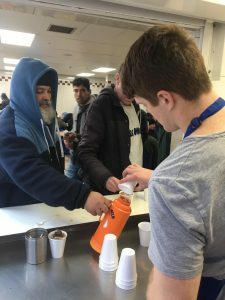 Our team of volunteers had a short glance into the amazing work Whitechapel Mission are doing, and the effort that is put into helping our community. The work that they do on a daily basis is inspirational, and they really saw the importance of giving something back and helping individuals who are less fortunate. 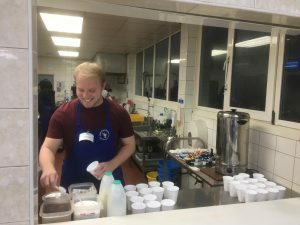 They were there for one morning, however the staff members at Whitechapel Mission are there 7 days a week, serving everyone with a constant smile on their faces. They open their doors to anyone, and provide a warm and friendly welcome always. They take the time to get to know every individual on a first-name basis, and understand each person’s background.